After a failed attempt to make gluten free orange and almond cupcakes, I needed to make something simple – using just the ingredients in my cupboard – to restore my confidence. And nothing could be simpler than this recipe. 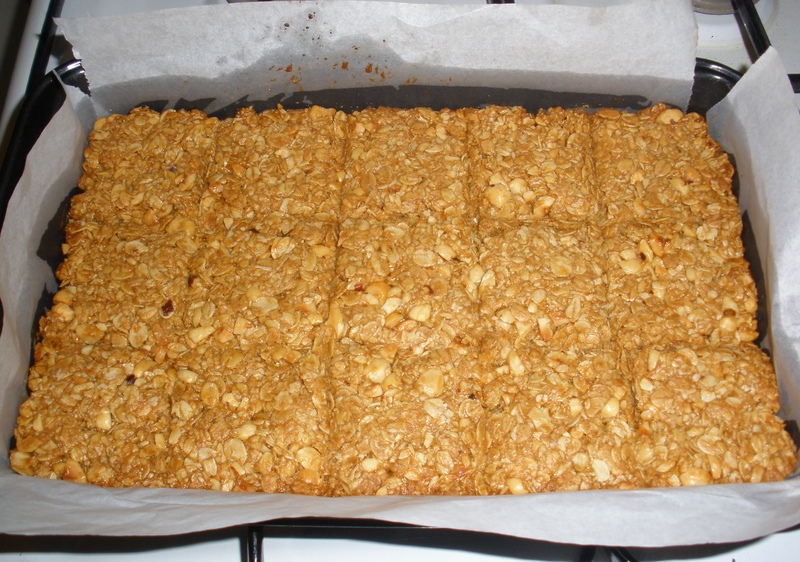 The combination of roasted hazelnuts, oats and golden syrup is delicious. It kept very well, so I ate it for nearly week as breakfast. Preheat oven to 180C. Grease and line a 16x26cm slice pan with baking paper. 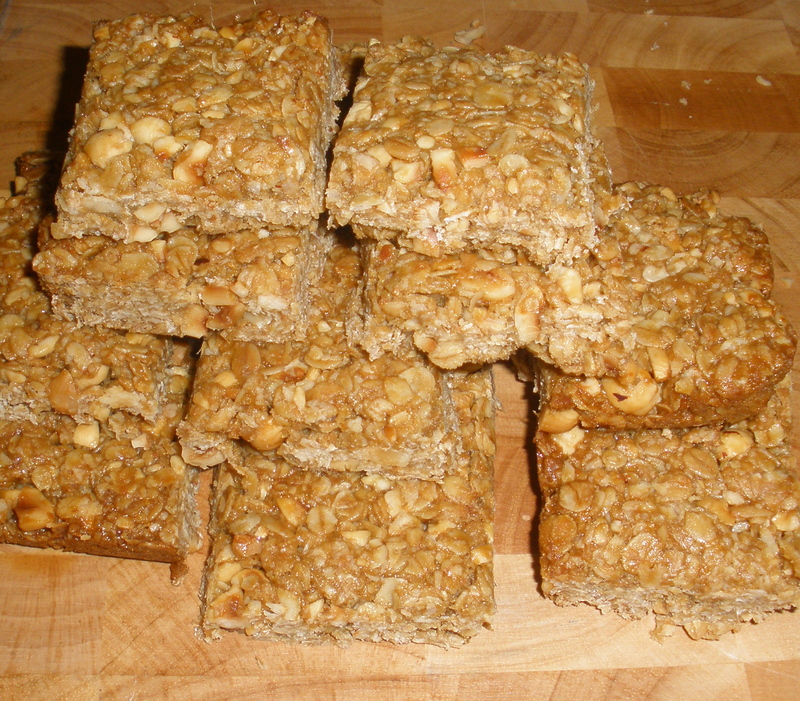 Place rolled oats, hazelnuts and flour in a large bowl and mix. Place butter, golden syrup and raw caster sugar in a small saucepan over a low heat and stir until melted and combined. 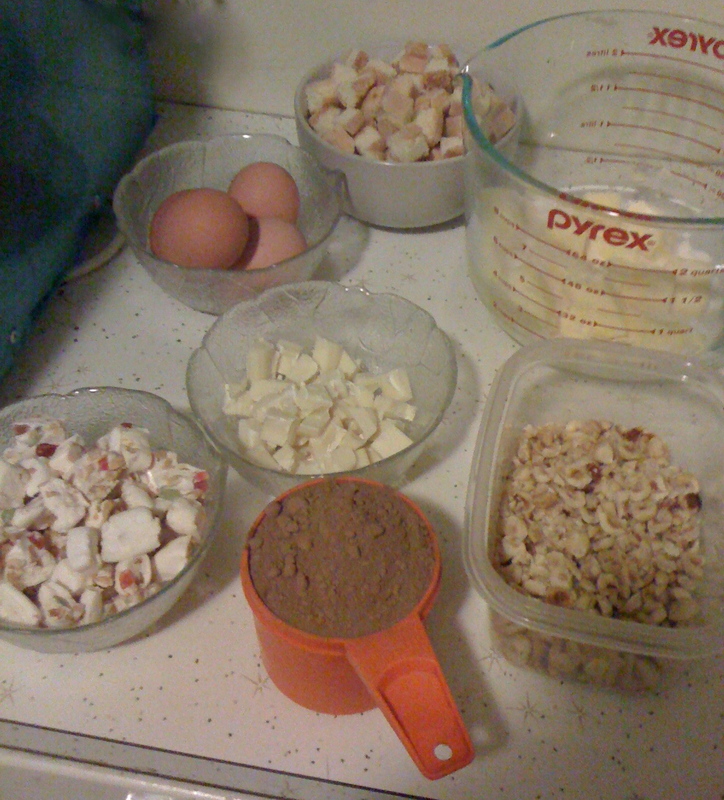 Pour onto the dry ingredients and mix well. Spoon the mixture into the prepared pan. Use the back of a soup/dessert spoon to smooth the surface. 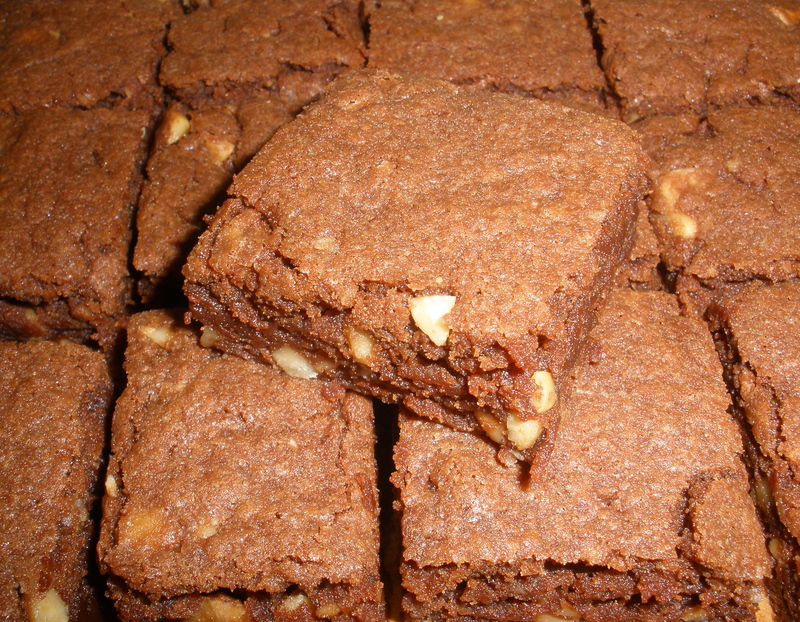 Bake for 20 – 25 minutes, or until golden and firm to the touch. Use a knife to score lines into the slice to make 16 pieces and allow to cool completely in the pan. Remove from pan and cut with a sharp knife. I do like to make fiddly treats. Something that you can really get your hands into. This roll/slice definitely falls into that category. I think it would have been helpful to have latex gloves on hand, but I made do baking paper and a spatula to shape the chocolate mixture in the log shape. I was very happy with the way this turned out and I think I will include it the little gift basket I put together for Christmas each year. Using an electric mixer, beat butter and sugar until light and fluffy. Add egg yolks, one at a time, beating well after each addition. 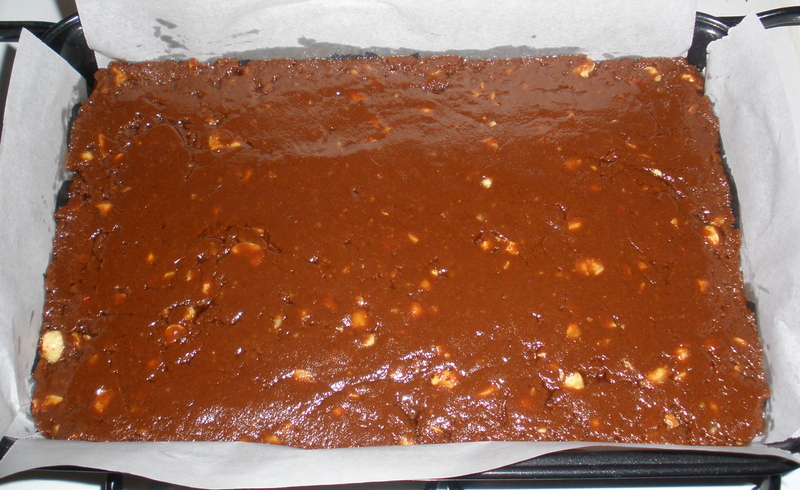 Fold in cocoa, then stir in nougat, savioardi, white chocolate and hazelnuts until well combined. Place a 30cm-long sheet of foil on a work surface and top with a sheet of baking paper. Spoon chocolate mixture along one long edge, leaving a 2cm border at both ends. 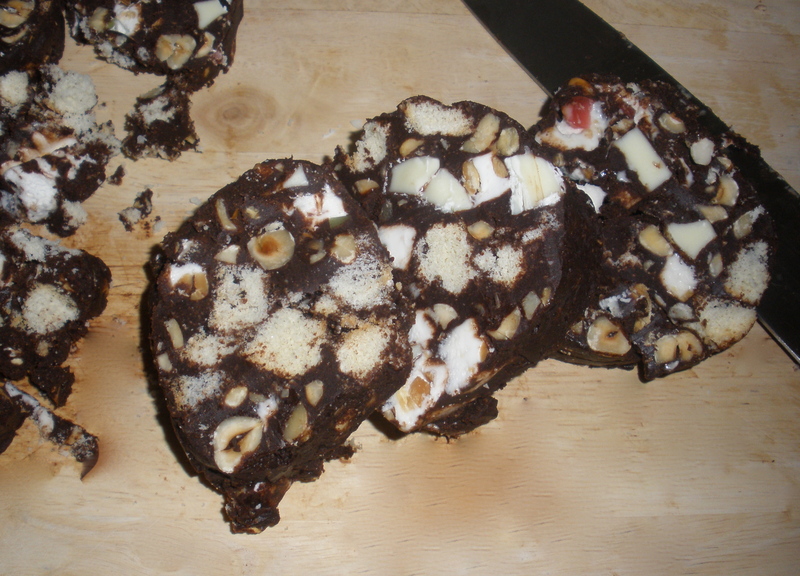 Roll up foil to enclose chocolate mixture and form a log, then twist ends to seal.